Zoodles are zucchini noodles. They slurp, taste and feel like real pasta noodles, except they are low in calories and carbs. This recipe is perfect for a low carb/higher fat day. Wash a medium zucchini, but you don’t have to peel it if you like the green colour in your pasta. Be aware that the peel contains a good portion of the zucchini’s vitamins and minerals, so eat the peel! Place the zucchini in your Spiral Vegetable Slicer and turn the crank. Add avocado, basil, garlic, lemon juice, nutritional yeast, and vegetable broth to a food processor and process until smooth. You may have to add extra broth (one teaspoon at a time) to get a creamy consistence. Set aside. In a large frying pan, heat olive oil over medium heat, add shallots and cook for about 2 minutes. Add zucchini noodles and cook for 7-10 minutes or until “al dente” (firm to the bite). Turn zucchini noodles occasionally using tongs. 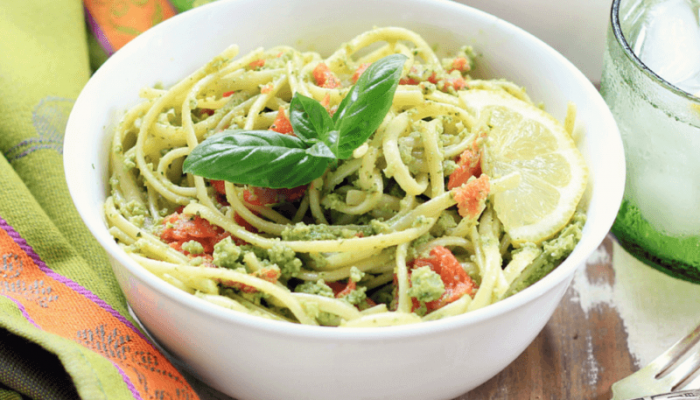 Remove Zucchini Noodles from stove, toss with avocado lemon pesto and smoked salmon, garnish with fresh basil, slices of lemon or top with grated Parmesan cheese and serve immediately.